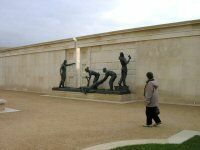 Since the idea of a National Memorial Arboretum was conceived in 1998, it was always the intention that it should include a Chapel for Quiet reflection for the individual visitor, and for services to be conducted for groups dedicating trees or plots at the site. The nature of the Arboretum and the timing of it's construction meant that the Chapel became linked naturally, both to the desire for peace, and the celebration of the beginning of the third millennium. These concepts unite in the dedication of the building to both Peace and Forgiveness. Words taken from the opening paragraphs of the Arboretum booklet. Click on the image of the plaque on the left for web site. 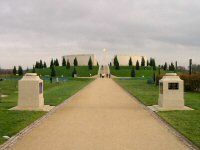 Taken from the rear of the main buildings, we have the visitor centre on the left with the restaurant and art gallery nearest to us, and on the right is the Millenium Chapel with one of the memorials in the foreground. I am not sure about it being called an Arboretum, when I was there in March 2001 it was more like a twiggery, I was hard put to find a tree bigger than myself, but they are growing. 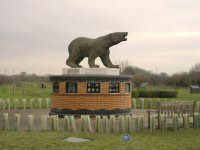 Now in December 2007, it has become more like a shrubbery, although many of the trees at the lower end of the site were damaged and had to be replaced following the floods in July of this year. Having said that, the place is a wonderful inspiration looking back over the last millennium of conflict in the world, and at the same time, in another fifty years this place will be a forest of trees and secluded memorials to the past and a celebration of the beauty of the surroundings, the peace and the tranquility far removed from the noise and violence of the past. Maybe when I get to the next place, I will come back as a gardener - so long as I can have a small dahlia patch in one corner, or is that bribery - I am not sure whether we can bribe the Lord like that. 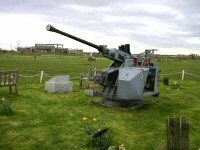 This memorial, which is to the Royal Artillery, is a delightful exaple of the many, many memorials around the large acreage of grounds which slope gently down from the car park at the front of the centre, all the way to the banks of the Tame River though the forest of treelets. 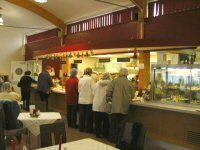 You will spend a few hours walking round this place, and even if you only came for a coffee in the restaurant on your way through, the place captures you as you walk round as it already, in it's first few years of being open, has a sense of peace in this place. You will enjoy your visit here, and come away thoughtful, and if you leave with some of the peace you experience here, you may help the world become just a little better for your having spent a while. 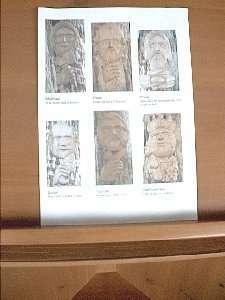 Inside the Chapel with it's rustic timber supports each one carved with an image of one of the saints, some of which are illustrated below. 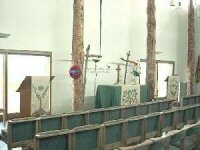 We see the communion table at the front with the reading desks at either side, behind which we look out to the arboretum and it's memorial park.